If you’re considering a vegan diet, one of the biggest changes you may have to make is going meatless. If you’re converting to a vegan diet from a lacto-ovo or lacto vegetarian diet, you’ve already stopped eating meat, and the transition should not be too difficult. But for some, going meatless is the biggest adjustment they’ll make when converting to a vegan diet. However, going meatless is easier than you may think. There are a number of meatless meals that are both delicious and healthy. Science has shown that plant-based diets can be very beneficial to our health, so there’s no reason not to try a meatless diet! Vegan, meatless diets are growing in popularity. Many athletes and celebrities have become proponents of a plant-based diet. New England Patriots quarterback Tom Brady, for example, recently began selling his TB12 Performance Meals via Purple Carrot, an at-home meal delivery service. These meals are 100% plant-based, perfect for those practicing a vegan diet. Even though they are meatless, they are still high in protein. The company has said that these are the recipes used by Brady himself. Brady, who recently just played in his eighth Super Bowl after winning the MVP award at age 40, swears by a plant-based diet. Brady is a Hall of Famer and arguably the best quarterback to ever play, and a diet with his backing and success rate is quite the endorsement. Studies have shown that choosing to substitute vegetables in place of meat can decrease your risk of high blood pressure by 55% and reduce your risk of heart disease by 32%. This could be particularly beneficial for the 33% of Americans who suffer from high blood pressure. Plant-based diets are the only diets that have been proven to improve or reduce chronic diseases. One study from Harvard University indicated that the more fruits and vegetables someone consumes, the less likely they are to develop cardiovascular disease. A vegan diet accounts for 78% less risk of developing type 2 diabetes. There are currently approximately 385 million people living with the disease, and that number is expected to exceed 600 million in less than two decades. Meatless diets could also aid in weight loss. Most fruits and vegetables are beneficial for two reasons. One, they are very fibrous, reducing your appetite and helping you feel fuller for longer.The fiber in fruits, vegetables, and grains can help both with digestion and lowering your cholesterol levels. Second, they contain fewer calories than meats, which can help you lose any excess weight. In fact, vegetarians have been proven to have lower body mass indexes than those who eat meat. As if those reasons weren’t enough, going meatless can also benefit your eyes and your skin. Many vegetables are packed with vitamin A, which is beneficial to your eye health, protecting against cataracts and macular degeneration. Your skin may clear up, as you won’t be eating foods loaded with saturated fats that can clog pores. Fruits and vegetables can also provide natural sun protection. Lastly, plant-based diets are extremely beneficial from a sustainability standpoint. Going meatless is the quickest way to reduce your carbon footprint. A pound of vegetables requires 1811 fewer gallons of water to produce than a pound of beef. Furthermore, one burger accounts for over 300 miles of carbon emissions. Meatless Monday is a movement that began in 2003. The movement pretty much speaks for itself, as it seeks to encourage people to cut meat out of their diets one day a week. This is done to meet the overall goal of a 15% reduction in meat consumption. The movement is a joint initiative between The Monday Campaigns and the Center for Livable Future and the John Hopkins Bloomberg School of Public Health. The Meatless Monday movement has expanded to 12 languages in 36 countries. You can sign up for the Meatless Monday newsletter here. If you’re thinking about beginning a meatless diet, it may be beneficial to start small with these Meatless Monday recipes. Many who go meatless find it difficult to commit to if they jump into it, especially if they frequently consumed meat before deciding to begin this diet. It can be tough to find enough recipes that you like, especially when you’re cooking ingredients you may not be familiar with. It can also be tough to go meatless because of outside pressures, such as the convenience provided by carryout. Restaurants that offer carryout, or fast food restaurants, may have a limited vegan selection. Ease into your meatless diet, starting with one meal a week, on Meatless Mondays. From there, increase to two days a week, and so-on until you end up cutting meat out of your diet entirely. Along the way, you’ll find recipes, ingredients, and seasonings that you like. Easing into the diet is an effective long-term strategy to remain committed to your meatless diet. Check out some of these recipes provided by Meatless Monday. Although we’ve provided a couple of our favorites, their website contains many more. The website allows you to search by ingredient, season, time of the day, or location. Additionally, there is a “Recipes by Week” section that will provide all of the recipes you need. This recipe is the perfect culinary balance between tart and sweet. There are minimal ingredients needed to make this delicious meal, which takes less than an hour to prepare. The recipe is intended to serve four. Each serving contains a mere 134 calories and five grams of fat, which primarily come from the olive oil drizzle. The meal also accounts for eight grams of fiber and five grams of protein. Keep Meatless Monday rolling right into Taco Tuesday with this delicious, easy-to-prepare meal. 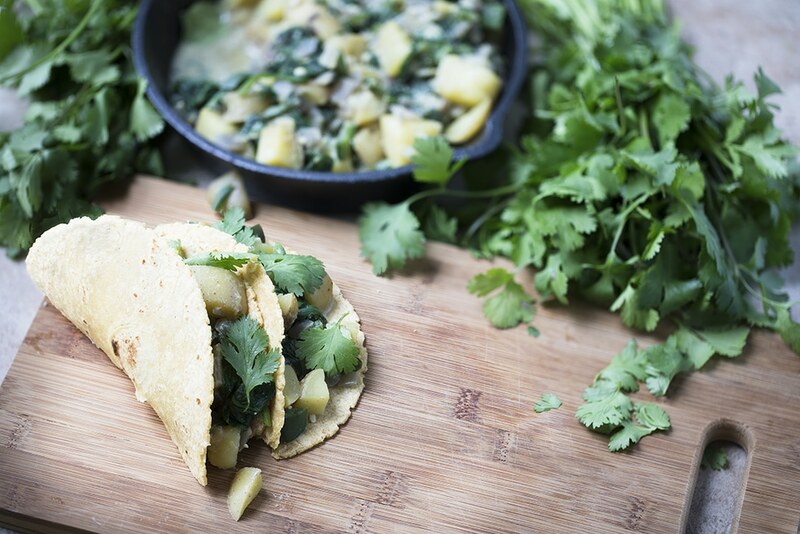 Featuring hearty potatoes in addition to spinach, onion, and garlic, these will arguably be the best tacos you’ve ever had. Feel free to add refried beans as a side dish for an added protein boost.The tacos provide 435 calories, 13 grams of fiber, and 16 grams of protein. They are also packed full of nutrition, containing 284% of the daily recommended value of Vitamin A and 139% DMV of Vitamin C.
This recipe is perfect for “Gameday.” You’ll still get a fair share of protein, although it will be provided through seitan, which is wheat gluten, instead of steak. The recipe is served on rolls just like a traditional cheesesteak. This meal can be completed in about 35 minutes. Each cheesefake contains 393 calories, four grams of fat, and a whopping 49 grams of protein. If you aren’t satisfied with those Meatless Monday recipes, consider some of these other vegan recipes. Beginning a vegan or vegetarian diet requires commitment, therefore it’s recommended that you prep your meals beforehand. Purchase your produce for the week at the local grocery store, and cook some or all of your meals on Sunday before the week begins. If your meals are already prepared, you’ll be less likely to stray from your meatless meals. Even if you prefer your meals fresh, you can slice, chop, and prep other aspects of the meal to streamline the cooking process later in the week. When browsing these meals provided by allrecipes.com, you’ll quickly discover that there are many delicious vegan alternatives to a meat-based diet. There are hundreds, if not thousands, of recipes for everything from breakfast, to dinner, to snacks. As one reviewer said, this is a great way to satisfy a food craving while avoiding dairy, meat, preservatives, and dyes. The reviewer also recommended stirring in some vegetables for an added crunch. All of the ingredients needed to make this recipe can be found at any common grocery store. The meal can be prepared in as little as ten minutes and is ready to eat in less than 45 minutes. There are 349 calories and 13.8 grams of protein per serving. This recipe proves that you can easily maintain a vegan diet without sacrificing your favorite meals. The meal has about a 4.5-star rating out of 580 reviews. The pancakes are ready in 15 minutes. Feel free to add your fruit of choice on top of the pancakes for extra sweetness. There are 264 calories per serving.